« “It’s the pRESIDENT, stupid”. A Limerick. No free speech in Australia, Carbon tax rules! A Limerick. 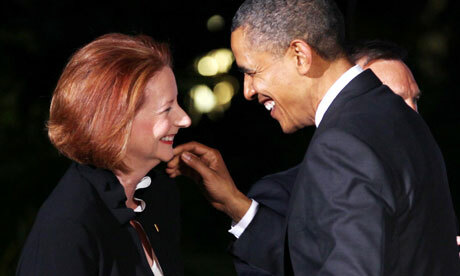 Obama and Julia. Transparency – Ha! * The Australian Competition and Consumer Commission has issued warnings to businesses that they will face whopping fines of up to $1.1m if they blame the carbon tax for price rises. This entry was written by lenbilen, posted on November 17, 2011 at 8:20 pm, filed under climate, environment, Limerick, Obama, politics, Politics, taxes and tagged Cap and trade, CO2, economy, free speech, Julia Gillard, Limerick, Limericks, Obama, politics, taxes. Bookmark the permalink. Follow any comments here with the RSS feed for this post. Post a comment or leave a trackback: Trackback URL.